EnergyShare, a new scheme set up by British Gas to distribute millions of pounds of funding to community-owned renewable energy projects, is looking for your votes for projects – including some in Nottinghamshire. After thousands of groups around the country registered on the site earlier this year, just 100 were chosen to go through to the next round of votes – including Meadows Ozone Energy Services Limited, The Greener Youth Club, Edwalton Primary School, Newstead Wind and Willow Wind, all in Nottinghamshire. Now, those groups need your vote to be chosen to receive a share of £500,000 worth of funding towards their community-owned renewable project. The projects with the most supporters will be told in December.Don’t worry if you didn’t register with the scheme – this is the first of several promised rounds which, in total, will distribute £3 million to community-owned renewable energy projects around the UK over the next three years. Sign up to e-enewsletters from Energy Share to make sure you know about the next round: www.energyshare.com. 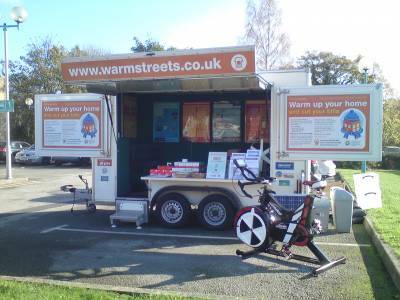 The Fantastic Home vehicle, complete with new energy bike, visited Bolsover District offices during October to promote the council's new insulation scheme. Aside from referring people to the Warmstreets scheme, the vehicle also allowed people to see how much energy they can produce by pedalling the brand new energy bike. A 14-year-old produced the most power – 477 Watts – which could power his Xbox, TV and speaker system... if he could keep pedalling for long enough to enjoy them! Lunchtime was a very busy period with crowds around the trailer. We distributed lots of free energy saving items and advised people on their saving options in the home. A few people were on the wrong tariff for their electricity, and some needed referring for Warm Front grants. Does Age Influence Views on Climate Change? The Number One Environmental Challenge Is…? tonnes of CO2 per year. The panels will be supplied by a global company which has a panel factory in Wrexham. change career and move into the renewable energy sector.